Recently, Vietnam has become a popular expat destination in Asia because of its nice weather, low-cost living, cultural diversity and wonderful natural beauty. There are millions of foreigners coming to Vietnam each year for business or tourism. Many foreigners visit Vietnam for the first time may wonder how to get a Vietnam visa. 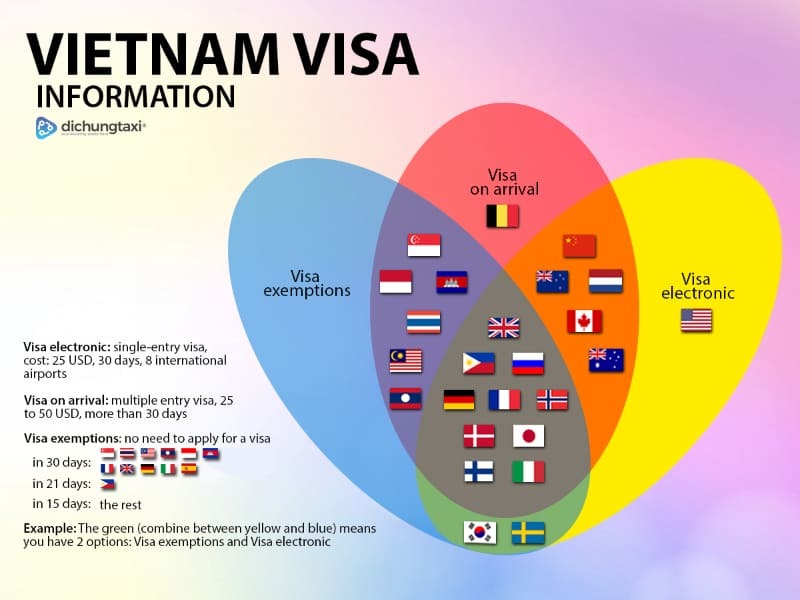 This article will show you detail information about Vietnam visa. Which visa should I do depending on my nationality? 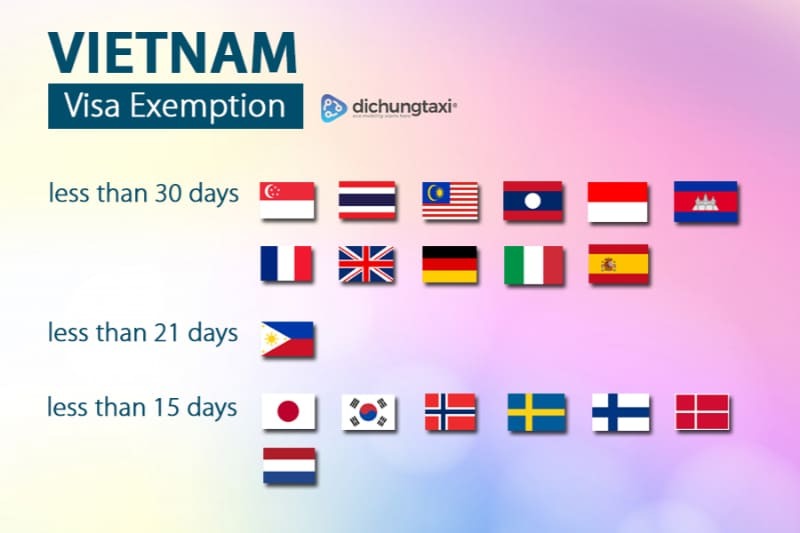 ***Starting from the 1rst of July 2018, French, UK, Germany, Spain and Italy citizens can stay 30 days maximum in Vietnam without a visa. Visa on Arrival is a convenient way that you can apply for a Vietnam Visa online. It takes from 2 hours (in case of super emergency request) to 2 working days to have it. You can easily find on the webiste of an authorized travel agency which you can pay for to get the Visa. How to apply for a Visa on arrival ? Step 1: Get started by filling out the secure online form. Step 2: Confirm and pay online. Step 3: Receive and print the Approval Letter. Step 4: Get the visa stamp upon arrival at one among three Vietnam international airports. You will get your Approval Letter via email within two business days, that you will have to print (in color, if possible, though it is not required) and prepare at least two (4cm x 6cm) passport photos. 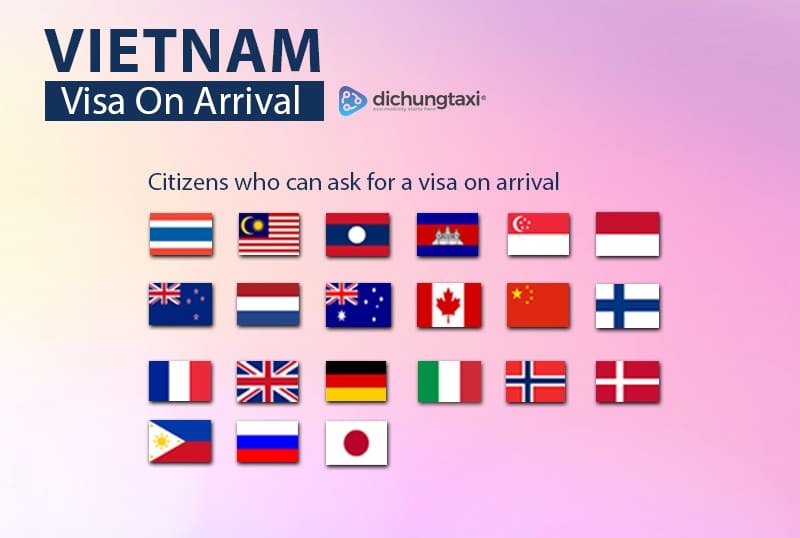 Upon arriving at one of the 6 Vietnam international airports which allows this Visa (Hanoi Airport, Hai Phong Airport, Da Nang Airport, Ho Chi Minh Airport, Nha Trang Airport and Phu Quoc Airport), travelers are required to complete an Entry/Exit form. You will then present your Approval Letter, passport, photos, and cash payment for the Stamping Fee in order to receive the visa stamped in your passport. Remember: online visa approval only applies to air travelers who arrive at one of Vietnam’s international airports. Citizens who can ask for an electronic visa: Azerbaijan, Argentina, Armenia, Australia, Belarus, Bulgaria, Brunei, Canada, Chile, China, Colombia, Czech Republic, Cuba, Denmark, Finland, France, Germany, Greece, Hungary, India, Ireland, Italy, Japan, Kazakhstan, Luxembourg, Myanmar, Mongolia, Netherlands, New Zealand, Norway, Panama, Peru, Poland, Philippines, Romania, Russia, Slovakia, Spain, South Korea, Sweden, Timor Leste, Uruguay, United Arab Emirates, United Kingdom, United States of America, and Venezuela. 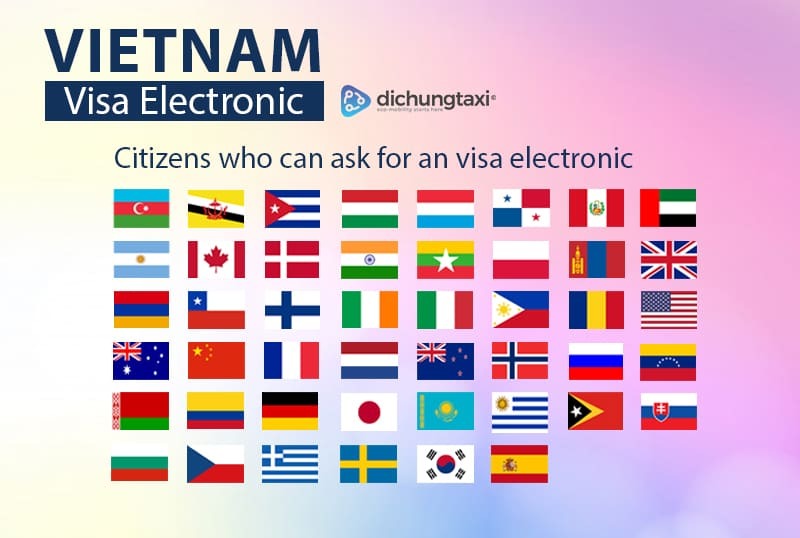 Electronic visa takes 3 working days to do and costs USD $25 to $45 (depending of the emergency of your request). Careful, the e-visa is a single entry visa, allows you to stay 30 days maximum and is accepted at 8 international airports, 14 land crossings and 7 seaports. How to apply for an e-visa? 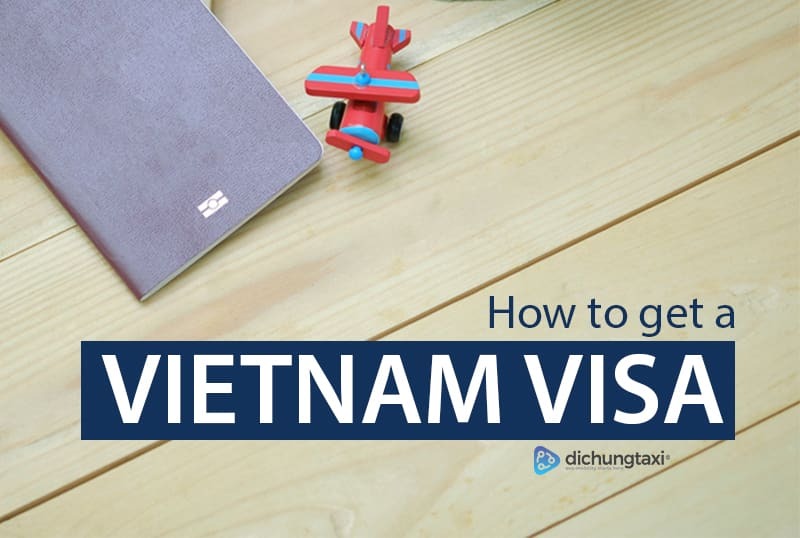 You want to apply for a Vietnam visa at the embassy? You sign up Online Vietnamese Visa Application click here. 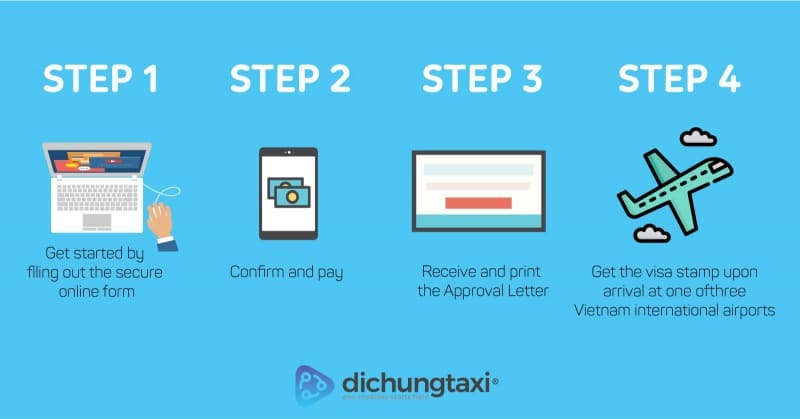 Finally, DichungTaxi wish you would have good experience in Vietnam. If you want to go somewhere to explore beautiful place and Vietnamese culture, you can book our service at dichungtaxi.com/en. You’re lost? Click here for a summary of all the visas you can choose!